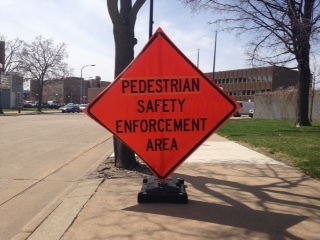 The La Crosse Police Department and the University of Wisconsin-La Crosse Police Department have recently been awarded a grant from the Wisconsin Department of Transportation to place additional patrols in the community to focus on pedestrian, bicycle, and traffic laws and safety. The La Crosse Police Department will be using high visibility pedestrian and vehicle enforcement in areas of the City that were determined to be areas of concern in the City of La Crosse’s 2012 Bicycle and Pedestrian Master Plan. The UWL Police will be enforcing in areas of concern in and around the UWL campus. Both agencies will be using additional officers at peak times and locations to enforce pedestrian, bicycle, and traffic laws. Some of that enforcement will include bicycle patrol, foot patrol, pedestrian and traffic enforcement, with both uniformed and plain clothes officers. The goals for these grants are to reduce traffic-related injuries and death; to gain voluntary compliance with existing laws and ordinances; and improve the safety and coexistence of all modes of transportation. Must yield to vehicles and avoid suddenly moving into the roadway. Must not interfere with a vehicle at controlled intersection and shall obey traffic lights, signs, and symbols. Must yield to pedestrians and bicyclists crossing within a crosswalk area. Cannot turn right on red in front of a pedestrian or bicyclist. Must yield to pedestrians and bicyclists when entering a roadway from an alley or driveway. Shall obey traffic control devices – traffic lights, signs, and symbols. Must yield the right of way to any pedestrian on a sidewalk/bicycle path and shall give an audible signal when passing such pedestrian. Bicycling on sidewalks is allowed throughout the city; HOWEVER, it is prohibited in the downtown business district. A bicyclist’s speed shall be no greater than reasonable and prudent when operating on a sidewalk or bicycle path. When riding in a street, bicycles shall ride with traffic in the same direction, as far right as practicable. The three exceptions are for: overtaking and passing another vehicle in the same direction, making a left turn, and when necessary to avoid unsafe conditions in the roadway. Use of hand signals is required when turning and stopping. Bicycling at night requires the use of a white front headlight and a red rear reflector. Front light must be visible to others from 500 feet away and the rear red reflector must be visible between 50 and 500 feet away. It is illegal to carry extra passengers on a bicycle (except a tandem). Although it is not a law or ordinance, wearing a helmet while riding your bicycle can prevent death or greatly reduce any injuries incurred if involved in an accident. ← LCPD and La Crosse Schools Celebrate 25 Years of D.A.R.E. Ticket the jay-walkers on West Avenue. Train or educate the students at the University and at Central High School that the buttons that activate the walk lights are there for their safety and use–so use them! Ticket the students that cross against the light. Watch the crossing on 7th St too near TC. Any time I drive through there, someone steps off the curb mid-block to read their cell phone as they cross the street. The improved crosswalk there is just a visibility hazard, and people just step off the curb assuming cars will stop. Please watch this area too for an hour on any given school day.